David was a son of George Don senior. He started his botanical career with his father, and his training continued with his brother George at Dickson’s Nursery in Edinburgh. In 1819 he moved to London, and following introductions through an eminent friend of his late father, he obtained a post as Keeper/Librarian of Aylmer Bourke Lambert’s large herbarium and library. He held the post until 1836. David visited Paris in 1821, where he met many prominent scientists of the age. In 1822 he took over the role of Librarian to the Linnean Society but continued as Keeper/Librarian for Lambert. The new President of the Linnean Society at that time was Robert Brown. The Linnean Society of London, founded in 1788, takes its name from the Swedish naturalist Carl Linnaeus. Its purpose is to share ideas and knowledge, as well as catalogue and describe the world’s biodiversity. It should be noted that Robert Brown had been born in Montrose and it is very special that 2 men born in Angus, should be in the top jobs in the prestigious Linnean Society. David held his Linnean Librarian post until his death. David had died in his apartment at the Linnean Society at 32 Soho Square London. A plaque at the site commemorates the Linnean Society and notes the names of eminent Linneans, including Sir Joseph Banks, Robert Brown and David Don. David described many of the pines and firs new to science at that time, including the Coast Redwood now known as Sequoia sempervirens and the Grand Fir now known as Abies grandis. In 1836 David left his post after a dispute with Lambert and took up the position of Professor of Botany at King’s College, London. When Charles Darwin came back from the famous Beagle voyage, he visited the Linnean Society to meet with David because of David’s botanical writings on South American plants. David married Mary Evans in 1837. They had no children. David died in 1841 and amongst other things, he bequeathed his portrait to his wife but the current whereabouts of this portrait is not known. He left his library and herbarium to the Linnean Society. Specimens which were used in the teaching of medicine were left to the Botanical Museum at King’s College. David was not a plant collector; his contribution was cataloguing plants and describing new species. He had a very large group of published works. 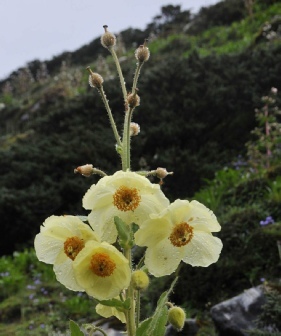 He was the first person to catalogue all the known plants of the Himalayas in his publication Prodromus Florae Nepalensis. This work was based on the collections made by Francis Hamilton and Nathaniel Wallich.